We recommend the API Line. Please read this manual. If possible, please use API Line instead of M3U list. An API line offers many more functions. Catchup service, MAG devices, Perfect Player with catchup and IMDB info only work with one API line. 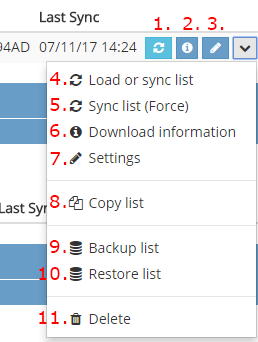 Click on the button "Add list" in the dashboard. You can now fill out this form. Here you can select the EPG source. Select one or more sources. The last selection "FULL" includes all EPG. It is not recommended to choose this source. The file is very big. With a smaller source, the player can process the EPG data faster. Fill out the form as in 1a). Leave the field "M3U File Link" empty and click on "Upload local M3U file. (In the next step)"
Click on "Save". You get back to the dashboard. Click on this Icon and upload your m3u file. If you click on the "Title" in the overview you will get the channel editing page. On this page you can edit your groups and channels. Determine whether the name of the group will be overwritten by the provider after synchronization. (*) Each channel has a unique StreamID. If you have assigned the EPG ID, you can download a file with the assignment. You can import these again for next lists. Each provider has different StreamID. So you can only import this file to the same provider. (**) With us the lists of providers are cached for 1 hour. Otherwise the firewall at the provider would block us because of too many requests. If you click here, the list will still be loaded directly from the provider. Please use only when needed. (***) We have a collection of picons linked to our EPG data. If you have assigned the EPG ID and are using our EPG data, you can also download our picons. If you click here, the download url of the picon will be inserted at valid EPG-ID. (*) If you want to replace a part of the channel name, you can use this function. Example: You want to remove "UK | " on all channels. Enter "UK | " in the Search for field. No entry in the field Replace with. Also note the spaces in the string!